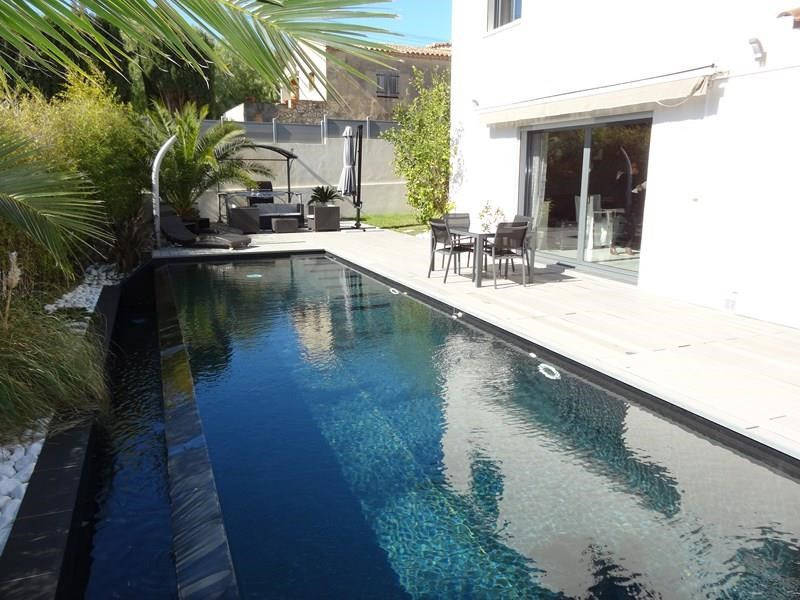 New villa on 2 levels with superb infinity pool, terrace, garden, barbecue, in a quiet area of Sanary sur Mer, less than 5 minutes from the first sandy beach (Gorguette beach). Villa equipped with 2 rooms (4 beds) with each its room d water. Ground floor: Large living room with lounge-dining room with fully equipped open kitchen, bedroom, separate wc. Upstairs: the second large bedroom and an independent toilet. Possibility of renting the villa in configuration 6 beds with 3 rooms, for a small supplement. Villa fully air-conditioned. Internet access WIFI. Pack your suitcases and dive !!! A nice well deserved vacation! Villa great comfort, air-conditioned, with 2 rooms among which 1 typed parental suite. Very nice swimming pool, garden of amenity, terrace, barbecue, outside shower, parking. Fully fenced. Villa modulable 2 or 3 bedrooms and 4 or 6 persons.